Prepare to set sail for fun and adventure! You’ve booked a cruise for you and your family. They’ll be no end to the delicious food and wild excursions but what about the entertainment on the ship? Don’t worry, you won’t have to hide out in your room when excursions aren’t going on. There will be plenty to keep you busy while you’re on the ship like Broadway productions and ice-skating shows. 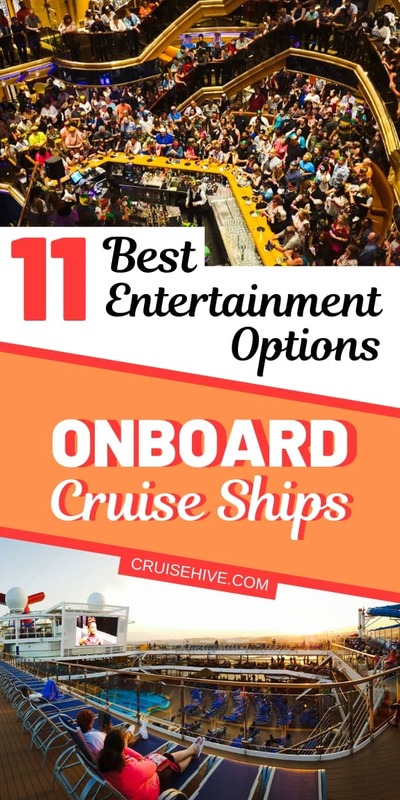 To help you figure out what you want to do on your cruise ship, here is some of the best entertainment that you will come across during your voyage. Are you worried about the kids having something to do? Well, worry no longer, most cruise lines have plenty of family-friendly shows that they can enjoy. For example, if you take a trip on the Disney cruise lines, they usually have shows going on that are based on the movies that your kids have grown up loving. If you don’t want to go on a Disney cruise, some of the other lines do have shows based on cartoons that your child may watch. For example, Costa Cruises have done Peppa Pig before. Royal Cruises, Princess Cruises, and the Norwegian Cruise Lines have started Broadway on the Sea programs (though Royal Cruises is the only one actually calling it that). You can see all of your favorite musicals like Mama Mia!, Cats, We Will Rock You, Rock of Ages, and some that you may not have even heard of before. You’re probably familiar with shows like American Idol and The Voice. Princess Cruise Lines have put their own spin on these by introducing their “The Voice of the Ocean” competition. Basically, guests who think they have a knack for singing will do a karaoke-style audition and if they’re chosen then they’ll be coached by pros to take part in the competition. The 9 finalists will compete live in front of all the other passengers who will be voting on the winner. If you’re aboard a Royal Caribbean mega-ship then you’ll have the chance to enter the huge outdoor amphitheater and check out the aqua shows. You’ll get to watch professional divers and swimmers dive off the highest platforms and perform ballet maneuvers in the waters below. With these beautiful feats along with the fountains, lights, and music, you won’t be able to tear your eyes away. Usually, when you think of cruises you probably consider them to be fairly calm and serene. So, the very last thing that you would associate them with is hard rock music. On the Blue, cruise company has a Monsters of Rock cruise which features several different rock artists. While you may think that it couldn’t possibly work, it’s pretty fun if you’re into it. On top of awesome aqua shows, Royal Caribbean Cruise Lines also have ice-skating ones. There is an ice rink located inside the Voyager, Oasis, and Freedom ships that is polished daily via Zamboni. Like the aqua shows, lights and music play out as the skaters perform. The shows happen daily during these cruise lines and you’ll find yourself wanting to go just about every day. There probably isn’t a person alive who doesn’t get a little fascinated by a Cirque de Soleil show. It’s for this reason that cruise lines are jumping on the chance to have performances on their ships. MSC Cruises has recently signed on with them so they can start showing performances. Guests will be able to sit and have dinner and drinks before each of these shows. Norwegian Cruise Lines has also jumped on the bandwagon by having magicians and acrobats come to perform on their Breakaway and Epic ships. Everyone loves a good comedy show. One of the best ones that you could ever see is improv because not only do you not know what’s going to happen next, but the performers don’t either. They go through skits that are completely unscripted. If you’re interested, The Norwegian Dawn, Epic, Gem, and Breakaway ships have all started showing these skits. If improv isn’t the style of comedy for you, there are several cruise lines that also have stand up comedy shows. Carnival has comedians that have appeared on many comedy channels come in and share their hilarious stylings. If you’re worried about them being a little too explicit for your children, if you take them to shows earlier in the day you should be fine. They don’t usually break out the R rated content until later on in the evening when the kiddos are sleeping. If you like music you should look for cruises that are offering a music festival. If you’re unfamiliar with what a music festival is, they have a bunch of musical artists come in and play. Sometimes they are famous bands and other times it’s bands that are a little under the radar. If you’re really lucky you may be able to get the autograph of an artist that you really love. If you’re bringing your parent along and they aren’t a fan of hard rock music or wild festivals, you may be able to compromise by finding a cruise line that is offering classical performances. Your younger child may find it a little boring but there is just something about classical music that is calm and easy to enjoy. If the idea of music with no lyrics bums you out, some cruise lines offer opera. When booking a cruise you have more to look for then delicious food and adventurous excursions. You also have to look for one that’s going to have the best entertainment for the entire family. Keep some of these options in mind the next time you book. Are you ready for your fun on the sea? Go here to book your cruise adventure today!